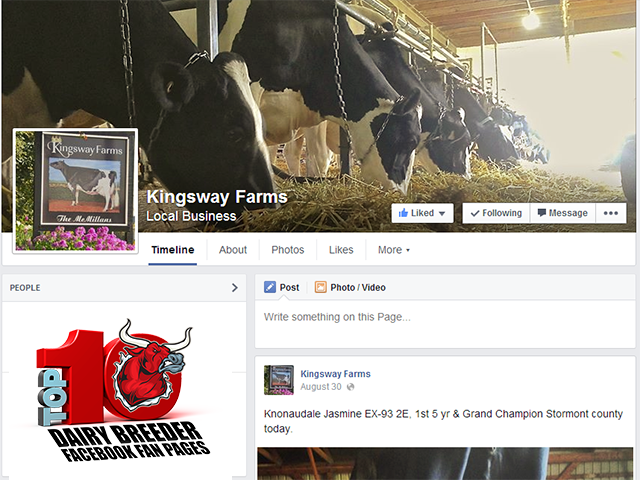 Does your farm have a Facebook page? 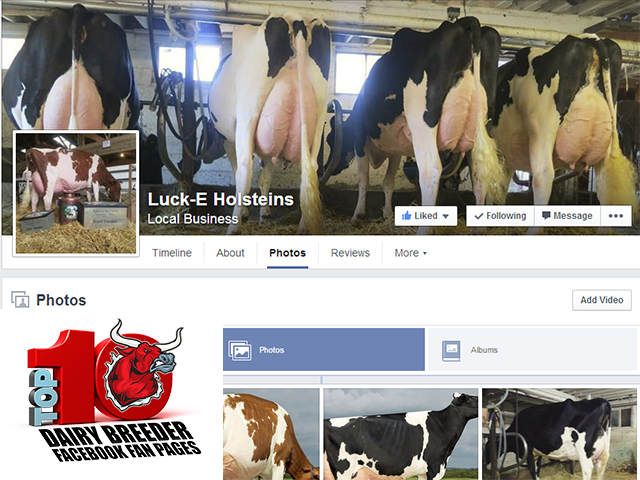 Have you ever wondered what it takes to have a successful Facebook page for your dairy farm? Well, look no further! 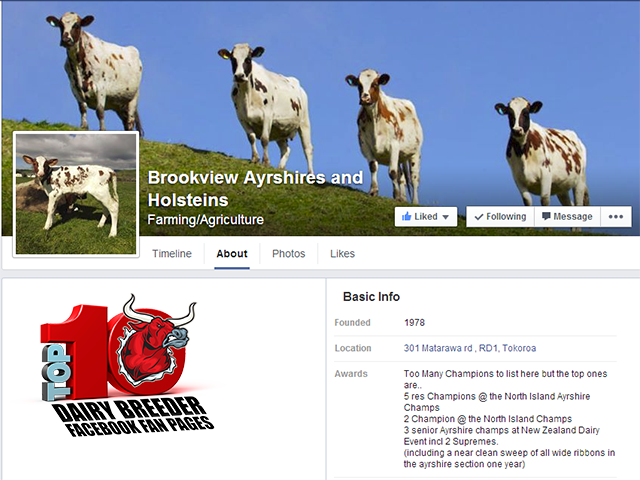 There is no question that Facebook has changed how dairy breeders connect with other breeders around the world. Facebook has replaced the old print publications of the past. 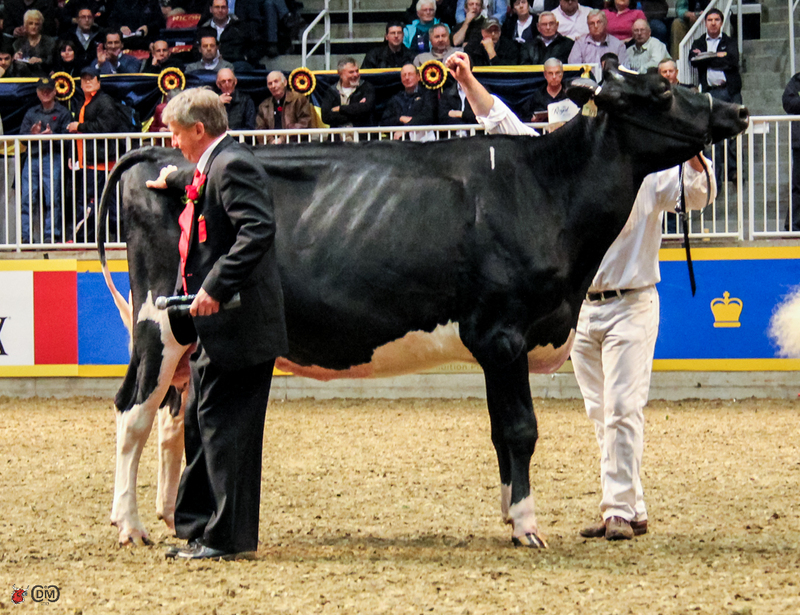 To find out the latest news and information, many breeders have either stopped advertising or have reduced how much they advertise in print publications and now leverage the power of Facebook to get their message out to the dairy community. 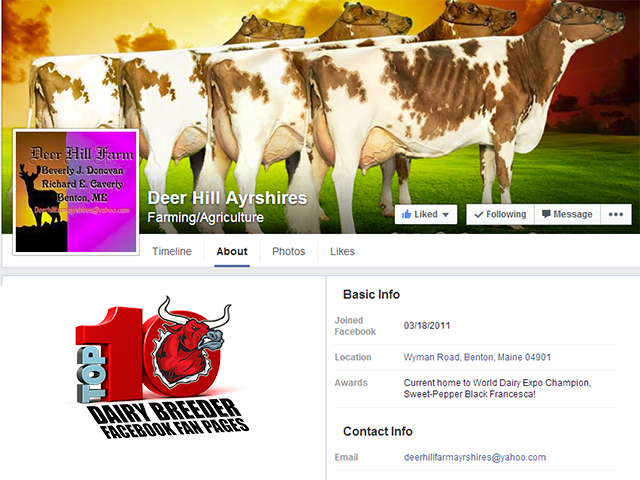 The following are the top 10 dairy breeder Facebook fan pages. 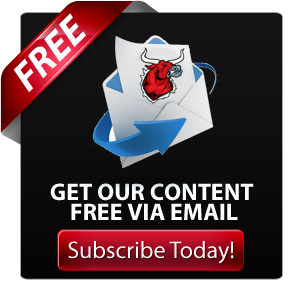 They have been evaluated based on, readership, engagement and the use of best practices. Please note: In order to qualify for this list they needed to be an actual Facebook fan page and not a personal account. 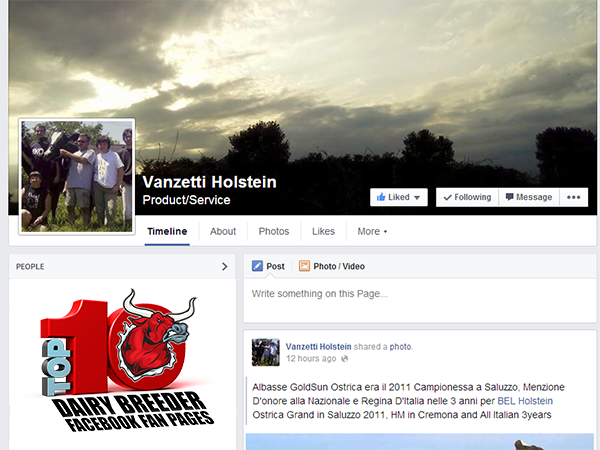 The only non-north American breeder page on our list, Vanzetti Holstein are from Turin Italy. They have over 180 cows milking in two Lely robots. Always sharing great content from around the world, their Facebook page has become very popular with those who follow them. 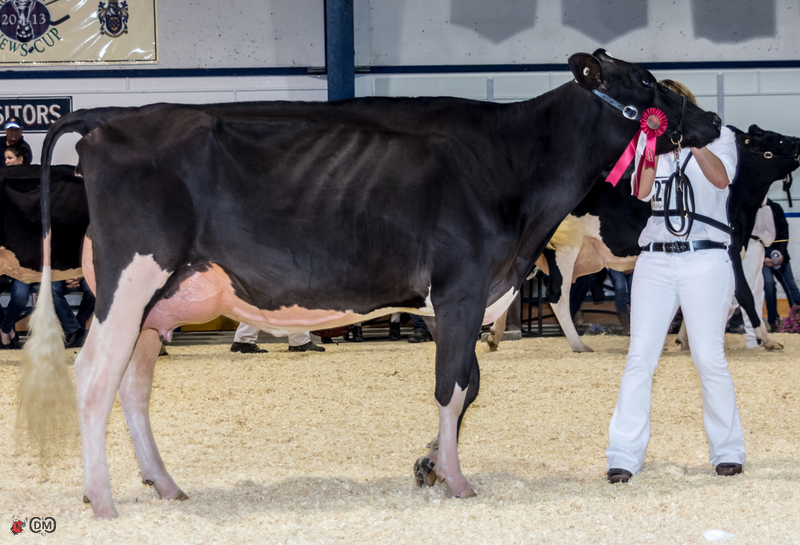 Doing an excellent job of sharing their many successes from the show ring, Ferme Jacobs has developed an extremely strong and loyal following for themselves. (Read more: FERME JACOBS: SUCCESS IS ALL IN THE FAMILY!) 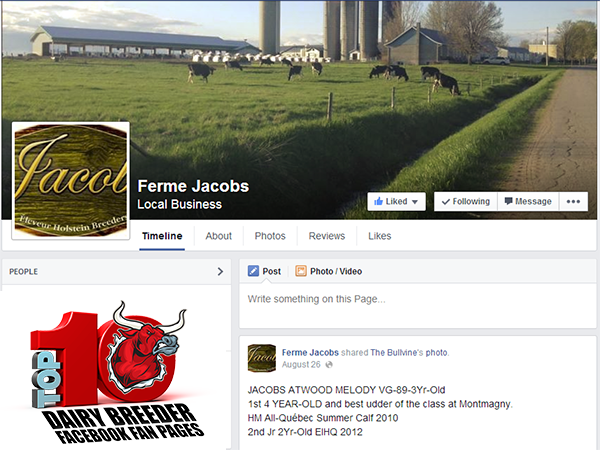 For those that follow the North American show scene, the Ferme Jacobs Facebook page has become a must see, especially during World Dairy Expo, where the team at Ferme Jacobs produces many outstanding videos of their trip, highlighted last year by winning Supreme Champion honors with Maya (Read more: Ferme Jacobs 2013: A Journey of Magic, Maya and Mastery!). 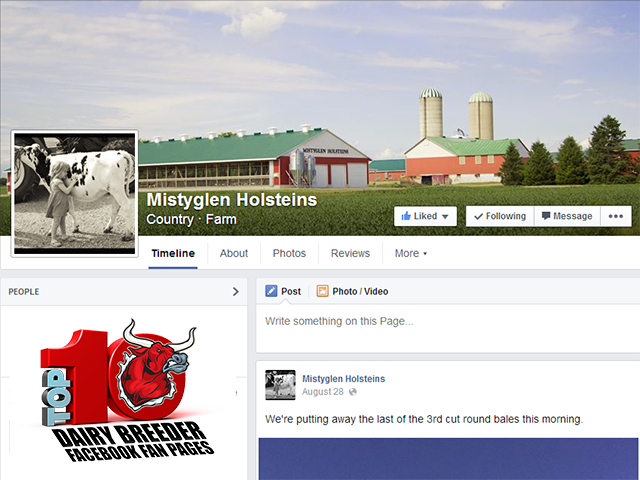 Posting some of the most beautiful farm scene pictures on the web, Mistyglen Holsteins, recently installed a new Robotic milker and documented the whole process on their Facebook fan page. (Read more: Mistyglen Take Two: “Siblings and Robots Inc.”) Mistyglen’s Facebook page does an excellent job of demonstrating to non-dairy breeders what a positive Dairy farming operation looks like. Never afraid to shy away from a great conversation, the McMillan family of Kingsway Farms in Hastings Ontario does an excellent job of sharing their success and developing reader engagement. Snapshots of the next great ones can regularly be seen on their Facebook page as well as many great conversations about what sires are getting the job done, or insight into what many breeders are talking about. 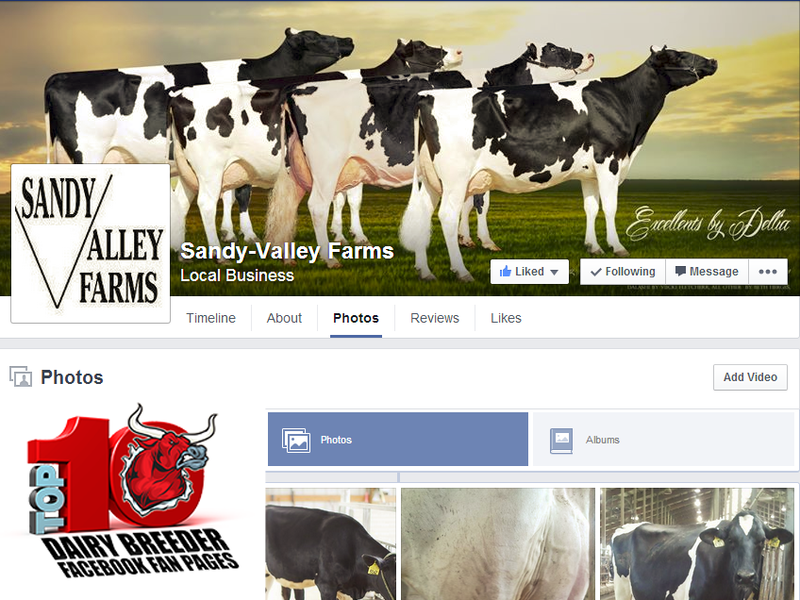 A 300-cow family farm focused on developing breed-leading cow families that deliver genetics that producers around the globe can believe in and trust, River Valley Farm does a good job of building their brand through Facebook. 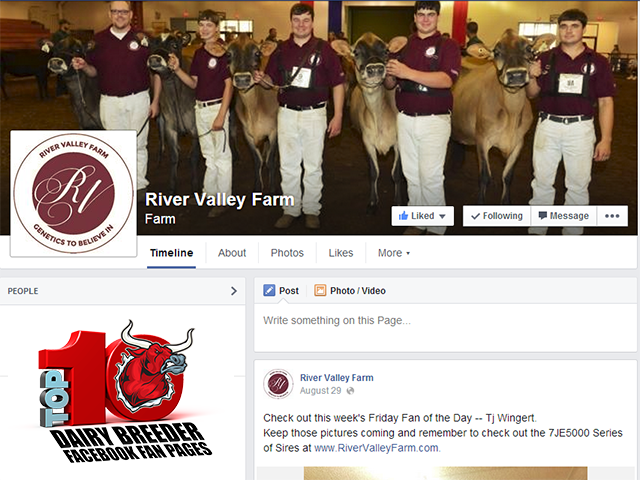 With their recent agreement with Select Sires and the 7JE5000 stud code series, River Valley has certainly added Facebook as an important component of their marketing strategy. Milk Source, LLC operates dairies, animal-care facilities and cropland in Wisconsin, Michigan and Kansas. 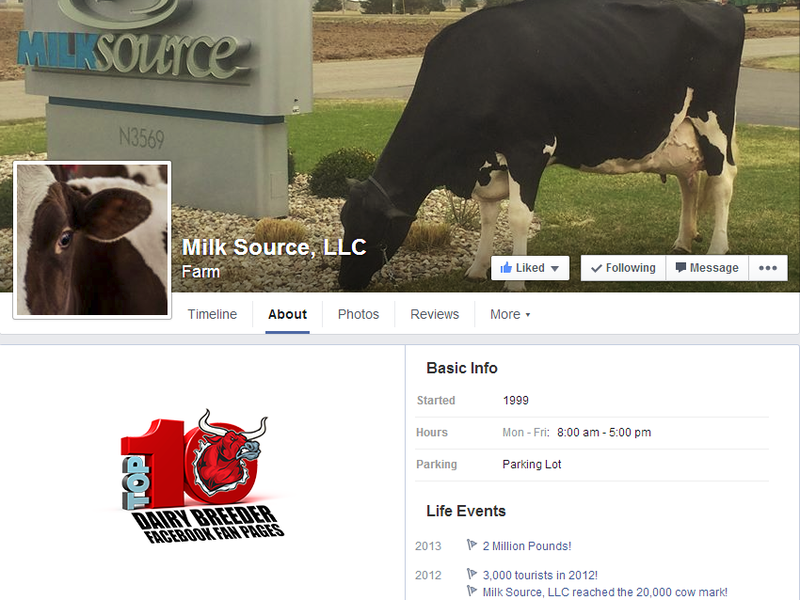 With both genetics to market as well as consumers to build brand awareness for, Milk Source has a variety of content on their Facebook fan page. 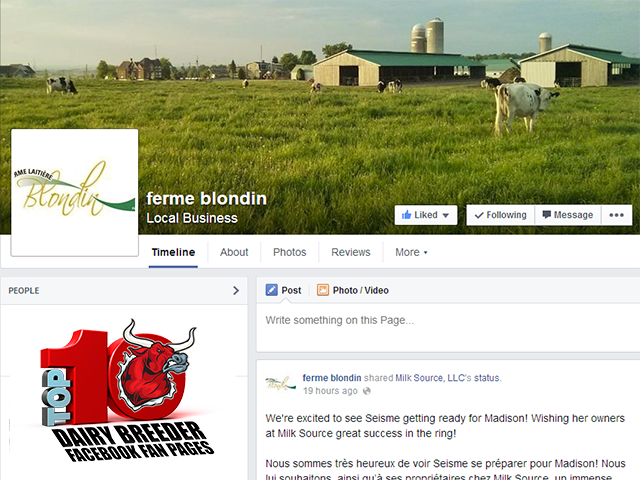 With cows like Blondin Redman Seisme-Red getting ready for World Dairy Expo, Milk Source has built a broad and diverse following on their Facebook fan page. What do you think about the above Facebook pages? Please leave your comments below. If you’re looking for the excitement of genetic discovery or want to keep updated on the mystery of what is the best and you are hoping to find it all rolled up in a wonderfully hospitable event … you need to make your way to St. Placide, Quebec for the International Intrigue Sale 2013 Edition hosted by Ferme Blondin on July 27, 2013. 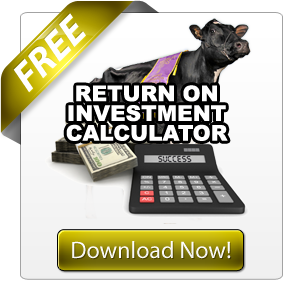 This could be one time where delving into Intrigue may cost you money but could also put you further ahead as you build your herd of top genetics, genomics and cow families. According to Simon Lalande there will be something for everyone. “The sale will be offering the best of all worlds, high genomics heifers, big time show cows and heifers and well-known cow families. Kim Cote enthusiastically agrees. “Jeff, Ed, Tim and Simon had done an amazing job when taking consignments to assure that it was only the best!!! 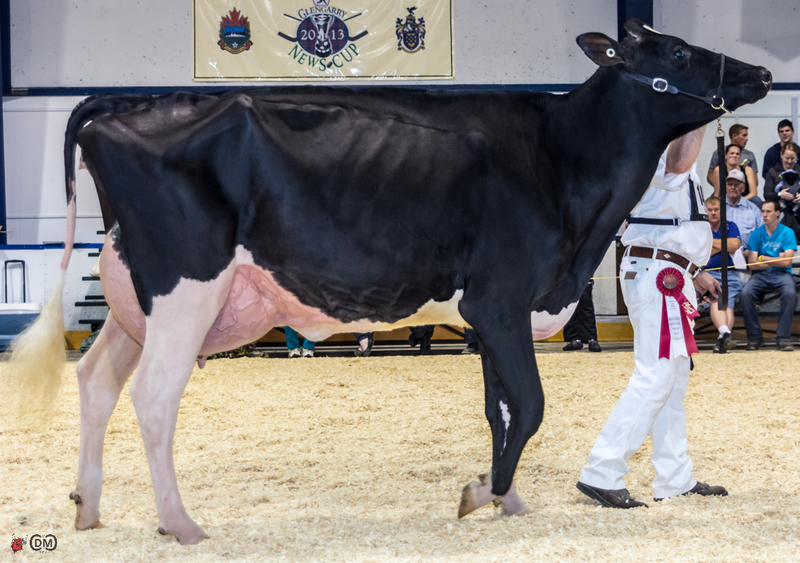 People that attend the sale can expect an amazing line-up of cattle and an opportunity to visit with other Holstein breeders with the hospitality going on from Friday afternoon to late Saturday night. We want that everyone attending the sale have a great time and relax with good friends!” Of course there will be the usual amount of exacting attention paid to every detail from the catalog to extensive advertising. Everything pulls together to make this a must-attend event where you can see some of the top animals in the world and have a lot of fun at the same time. If enthusiasm is any indication, then the 5th Intrigue sale is already headed for success. Grand dam is the dam to the very popular bull Regancrest AltaIOTA! Family with al lot of proven bulls like Durham, Dundee, Damion, Mac, Million and many more! Obviously “International Intrigue” is good for cattle buyers but it has proven benefits for the hosts such as Ferme Blondin too. “Hosting the Intrigue sale the first time was really good for us because it brought us a lot of people that never had the chance before to come and visit the farm. We made a lot of new contacts in the business and a lot of new friends!” Kim Côté has encouraging words for future hosts, “If someone has the potential of hosting one of the future sales, they should go ahead! It has been a pleasure for us to work with Jeff, Ed and Tim. They are great people that all share the same passion: cows! Ed Fellers, co-owner of Butler and Fellers is super happy with the lineup for this Intrigue Sale. So much so that he refuses to narrow his list of favorites. “I will say that we have 15-20 heifers and young cows that have the potential to contend or win at this year’s National Shows! We also have at least 6 high genomic heifers selling with over 2500 gTPI! Additionally, we have the #1 Polled RC female in the World selling, the highest and 2nd highest gTPI polled females ever to be offered at public auction, and several more breed leading flush age Red and RC polled offerings! 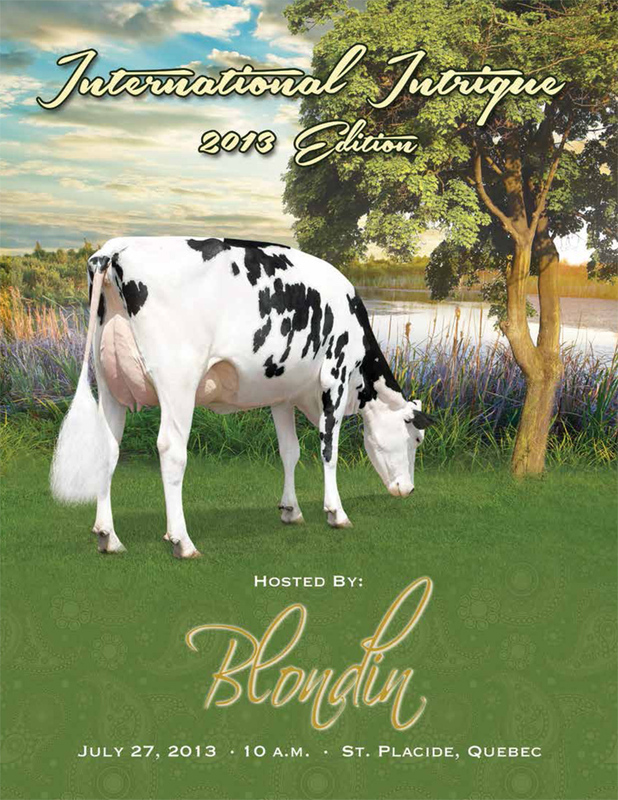 Choices sell from the number 1 gLPI cow in the World and the number 2 gTPI cow in the World as well as from the #1 flush age polled female in the World!” There is undoubtedly a favorite for every dairy breeder with a specific focus. 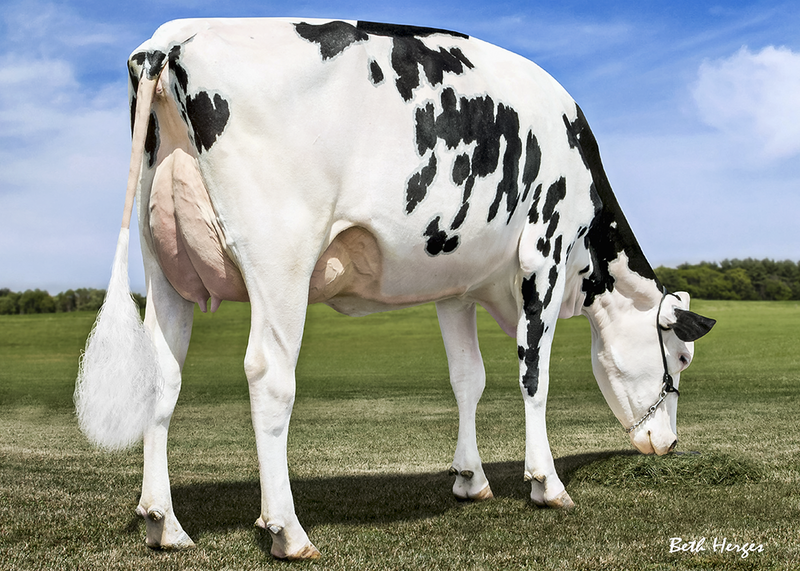 Two that stand out are MOM Kool who sells as Lot 1 and is the number 2 Protein cow in North America. 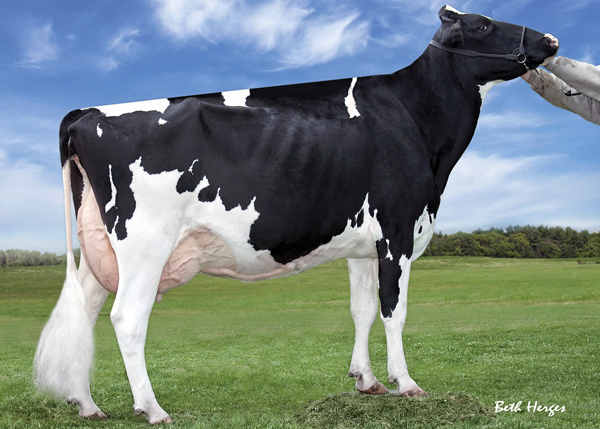 Aubry sells as Lot 5 with the potential to become a truly incredible Brood Cow….. And the list goes on! From the benchmark 5th year of the International Intrigue Sale we look back to where it all began. Her Goldwyn daughter Cash is one of the hottest young cows in the world, she sold for $205,000 and has progeny testing way above parent average! Dam of Gold Chip…one of the most popular genomic sires in the World & Mr Chassity Colt 45-ET *RC, *PO, +2248 GTPI, the #1 RC Polled Bull in the World, available through Jetstream Genetics! 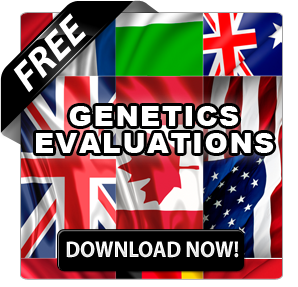 History confirms that International Intrigue Sale animals have gone on to become breed leaders and produce some of the best genomic offspring the breed has ever seen. Likewise the type animals have proven their worth as Champions and All Americans and All Canadians. Take the opportunity to be at Blondin on July 27th. 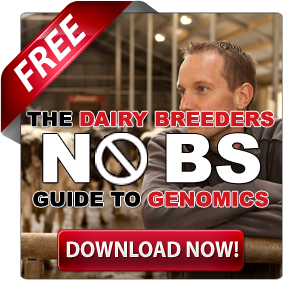 Not only could you buy a top animal with the obvious benefit to your breeding program but you will have the fun of sharing the excitement with the best marketers in the Holstein industry.